Taxi is on-the-move 7/24—literally. Drivers pick up and deliver customers constantly, with little down time, and no guarantee of wired connectivity at any time, on any shift. WisePOS™ provides a safe, reliable, and mobile payment solution to keep transportation businesses moving. WisePOS™ expands customer payment options to debit, credit, and even tap-and-pay with customer-friendly functions that allow for easy tipping, fare-splitting, and coupon redemption. Advanced driver apps provide business-related functionality like scheduling and bookkeeping. Integration of WisePOS™ with the meter itself reduces the possibility of fare tabulation errors. WisePOS™ keeps transportation businesses moving forward and moving up. • Provide totally wireless transaction capacity. • Expand payment options and customer satisfaction. • Offer easy tipping and receipt options to customers. 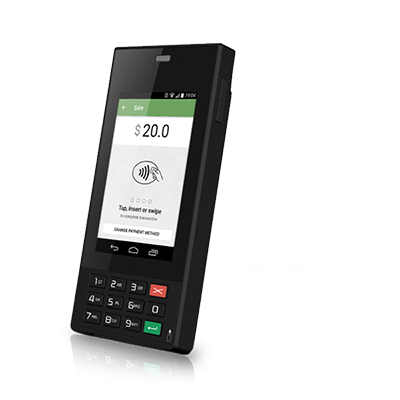 • Maximize driver security with a flexible and cashless mPOS system. • Utilize expanded functionality to provide real-time transaction information. WisePOS™ is 100% mobile—it requires no wired connectivity. WisePOS™ accepts most cashless payment options: debit and credit cards, tap-and-pay. WisePOS™ processes transactions in real-time, and sends receipts via email or sms. WisePOS™ apps provide extended functionality, like scheduling and bookkeeping. WisePOS™ prompts for tipping and coupon redemption. WisePOS™ eliminates fare tabulation errors. • Totally stand-alone system with expanded payment options. • Real-time payment processing and validation. • Immediate accounting of fares and payments. • Apps to push tipping and coupon redemption. • Driver apps for scheduling and accounting.